Markets reacted positively when Elon Musk, CEO of Tesla and Space X tweeted about his Second Top Secret Master Plan. Shares for Tesla Motors responded strongly and closed 4% up. Here’s why. Elon Musk’s quests have inspired NASA to use SpaceX rockets and thousands of people to buy his Tesla cars and in doing so join him on an exciting adventure. Building a questing culture is an immensely powerful leadership approach because it is something competitors cannot copy, it’s why Tesla and Elon Musk are separate and ahead of the pack. The important thing to recognise is that quests do not replace existing vision, purpose or strategies, rather quests invigorate and bring them to life. Let’s explore how Elon Musk as CEO uses quests to drive his company’s purpose and strategies. A clear, inspirational outcome-focused destination. “Build me a sports car capable of beating a Porsche or Ferrari in a head to head showdown,” said Elon Musk to his team of engineers and designers. Quests are powerful because they provide a clear destination to focus. The quest to beat a Ferrari or Porsche is very clear, it is outcome focused and there is no ambiguity. His team had a very identifiable and quantifiable target to adventure towards. Musk’s quest is also hugely inspirational, which would be very clear when the team were tracking off-piste, heading in the wrong direction and when they had arrived at the destination. Challenge the Impossible: The idea of an electric car beating a Ferrari back in 2006 was a crazy impossible idea. Think of the image of most electric cars ten years ago ““ low performance, heavy batteries, small engines and slow. But by dreaming big Elon Musk inspired his team of engineers and designers and they made the impossible possible. Deliver meaningful benefits: Quests deliver meaningful benefits to the people who matter most. For Elon Musk and Tesla this was not only their customers but also the broader society and world economy addicted to a hydrocarbon economy. Many of Musk’s critics argued that an expensive roadster was hardly going to have a beneficial impact on reducing demand for fossil fuel energy, creating a more sustainable economy or even ultimately saving the world. 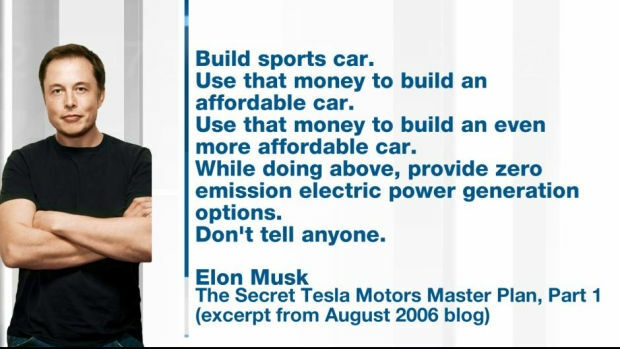 But as Elon Musk said, these critics, “missed the point.” Elon Musk explains that his strategy was to “enter at the high end of the market, where customers are prepared to pay a premium, and then drive down market as fast as possible to higher unit volume and lower prices with each successive model.” Each successive quest builds on the success of the previous one. Another great thing about a quest is that it offers up an amazing story to engage customers through. By the time Tesla announced the Model 3, a low end affordable mid-range electric car, over 400,000 people jumped at the opportunity to pay $1,000 deposit and the privilege to be in line for a car that has yet to be manufactured and won’t be available until Q4, 2017 at the earliest. Elon Musk is achieving a lot more than just selling another car, his quests are inspiring customers and talented colleagues to join him on adventuring towards and achieving Tesla’s purpose. Powerful stuff from a leader who understands how to leverage the awesome qualities of a CEO’s quest. Tell people about your masterplan, don’t guard it like some secret strategic lifeblood. Have the courage to strike out and find new ground. Do something people think is impossible or can’t be done. This does not have to be going to Mars. Just think what are the things people believe are impossible in my industry but if done would dramatically benefit our customers. identify that, then go on a quest to achieve it.